A layout is more than a trackplan or a bunch of construction techniques. As I shared in the previous post, it’s a story and the way all the pieces of the puzzle fit together to influence our experience of that story. I had the chance to see and use the new ProtoThrottle from Iowa Scaled Engineering at the Collinsville (IL) RPM Meet last weekend. If you haven’t already, you will be hearing and reading a lot about this product and I’ll leave the reviews of the technical details and setup to others. This is not intended to be a full review rather, in this post; I want to share how it impacted my thinking about layout design and operations. As model railroaders, we are used to twisting a knob and flipping a toggle switch to manipulate the train. The results were immediate and after a time become mindless to a large degree. 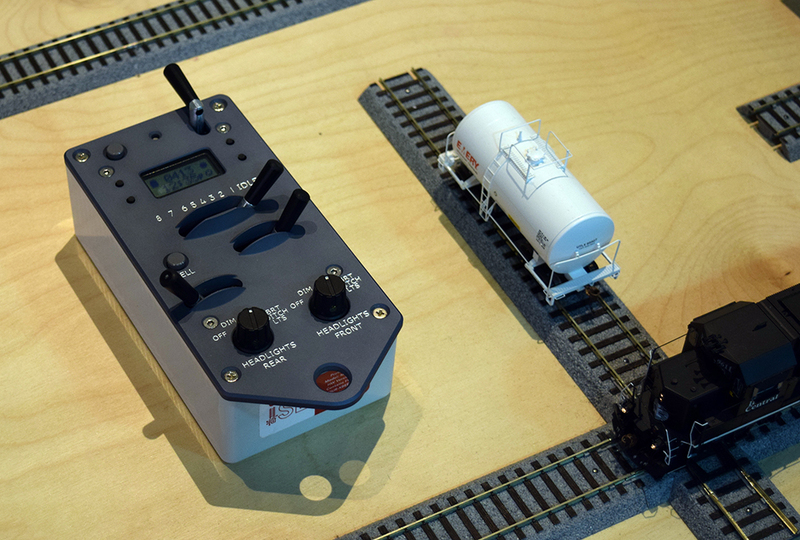 When the early transistorized controllers and later, DCC, arrived with features like simulated inertia, operating a train took on a different dimension. Modelers had to anticipate and prepare for what was going to happen next, rather than just react on a whim. 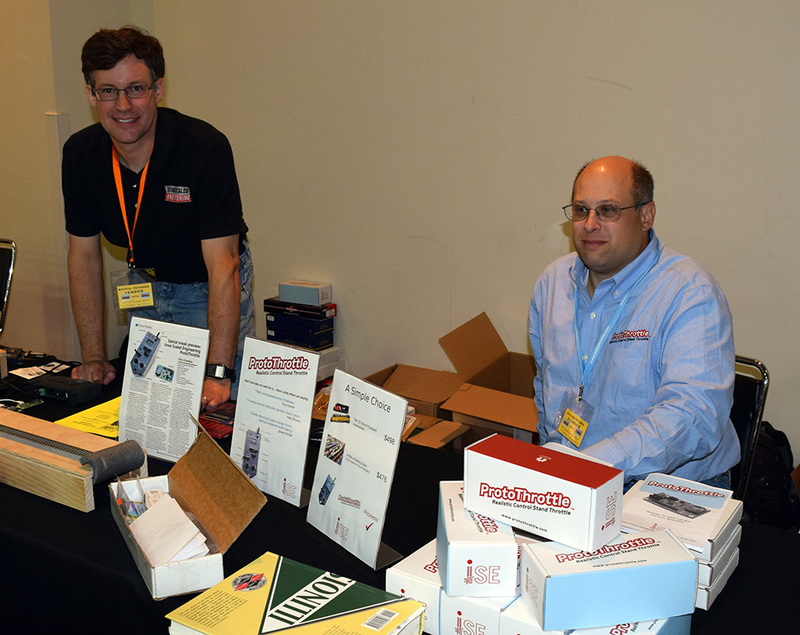 Michael Petersen, one of the founding partners of Iowa Scaled Engineering, gave me a quick rundown of the various controls and it was time to run. My sound equipped diesel had a satisfying amount of momentum programmed in the decoder and my initial foray was simply running up and down the stub ended spur track it sat on, just to get a feel for things. Michael Petersen (left) and Nathan Holmes of Iowa Scaled Engineering. With separate controls for speed, braking and reverser, it didn’t take long for the brain cells to wake up and start smelling the coffee. At first it was counterintuitive and reminded me of learning to drive a stick shift for the first time. You have to manipulate several levers in sequence or simultaneously to have the loco do what you want it to but after a short time, you get the hang of it. That’s when the fun begins. The story I have tried to tell with almost every layout I’ve built is one of slow deliberate train movements that convey the ponderous mass of full-size equipment. I could sense immediately how this throttle would put that story on steroids. The guys had a simple demonstration layout that allowed one to make a variety of common train movements. Once I was familiar with the controls and the operating characteristics of the loco, I wanted to see what coupling up to a cut of cars would be like. With separate throttle and brake functions to consider, my approach involved judging the distance and then backing off on the throttle and applying the brake while closing the gap. I was so intent on making a soft couple that I forgot to move the reverser after the pin dropped, so instead of pulling the cars, I kept shoving them backward. (I almost heard dad’s voice in my head. Use the clutch son. NO, second gear!) It reemphasized for me the difference between running a toy and what’s required to safely run a multi-ton locomotive. My inexperience created a few more laughable boo-boos such as nearly sideswiping a hopper car that was left too close to a turnout. Fortunately, the brakes work really well! Whew, that was close. In the all-too brief time I used the ProtoThrottle, it gave me a better understanding of what running a full-sized locomotive must be like and why railroads prefer a simple track arrangement. When I asked Scott Thornton how, in the early design stages, he envisioned people using the throttle he said it was designed for walk around from the start. Scott’s motivation was to have a more realistic experience of running the train and he approached Michael and his partner Nathan Holmes about developing the prototype. From those initial conversations and after 27 months of development time, modelers now have a product that will likely impact the way we design and operate our layouts. In the tech world, user experience (UX) is a big deal. It’s less about what the technology itself can do and more about what the technology allows you to do. Design is also a prime consideration. What is it like to use this device? Is it easy to hold? Are the buttons too big or too small? Are they easy to find with a simple intuitive hand motion? Tech companies spend millions to answer these questions and many others. My user experience was largely positive. I found the control levers simple to access and use without having to constantly look at what I was doing. The positive detents of the throttle lever provided a satisfying feedback. Because it was my first look at the unit, I didn’t play much with the other function buttons except for ringing the bell. I did however find the bulkiness of the case a bit tiring to hold for an extended period. As Scott explained, at this stage the overall size is dictated by the internal components especially the battery pack. The unit is designed to use with a lanyard and many will use it that way. I suggest also that this is where layout design and operating styles will play a large role. On a small layout featuring a single scene, the unit could be slotted into a custom holder attached to the fascia. I’ve no doubt that future versions of the throttle will address any design and usability issues based on user feedback and the never ending advances in digital components. As enthusiastic as I am about the product (and I’m not alone judging by the comments I heard at the show) I can foresee that impatient operators might find it frustrating. The run and gun mentality is well entrenched in a lot of people who just want to go and stop on a dime. Whether this product is suitable is for the individual to determine for him or herself. Currently, I don’t have a layout. Since dismantling the Indiana and Whitewater, I’ve been thinking about the best way to pursue my interests. I’m leaning toward a modest single scene of 8-12 feet in length focused on that story of deliberate train movements. After last weekend, that design slowly began to revolve around the operating potential this throttle offers*. *As with any product, mentioned in a post, I do so because I believe in it or use it personally. I have no connection with any manufacturer profiled here and there are no affiliate links or other monetary arrangements, unless specifically noted. My friend Trevor Marshall has purchased a ProtoThrottle and shares his impressions and the setup on his layout in these posts on his own blog. A side effect of this immersive user experience, will be a realisation that quality of operation is so much more satisfying than mere quantity, and a simple layout such as your now dismantled I&W, or Scott Thornton’s own “Milan Branch” are more than enough to satisfy a solo operator, or a small group. This in turn frees up time and money that would have been spent on that never-satisfying basement empire. This can now be invested in better quality models, in terms of finished product and also buying the very best components to use as the basis of a unique model – I am thinking of Tony Sisson’s recent book on the SW1500 – and in attending to finer details. Well, maybe: this will not be for everyone, but maybe a few open-minded modellers will find themselves re-thinking their “dream layout”. I first saw this at the Portland RPM when it was still in beta phase. Immediately, I felt like I was back in the cab of a locomotive. It changed my ideas of a grand layout to a smaller simpler two town switching layout. This also caused me to rethink how I control my trains (not currently using DCC in large scale). Combination of overweight cars (scaled to prototype weights), roller bearing wheels that offer little rolling resistance, and the Protothrottle is about as close as anyone can get to operating the real thing. I believe that Scott T and ISE have created a wonderful tool to be added to some of our layouts. I first used the PT at Trainfest 2017 and after 5 minutes I was hooked. It took me from running a locomotive to feeling in control of a locomotive. That was so much fun. I have now had my PT running on my layout for less than a week and I cannot put it down, it is fun, it feels good and that is what a hobby should be, a good feeling. I have tried to practice slowing down my operating the layout prior to the PT but the PT helps makes you understand why you have to slow down. Yes, I also have pushed a few cars around. Joe Atkinson on his blog at the MRH forums describes how he is operating with the PT and how his feel of realism has been upped. Anything that makes your hobby more enjoyable to you the owner IMO is a good thing. The throttle is not for everyone, but ISE is not pushing it as that. I appreciate your blog entries and agree that folks have to make their own determinations. That however has always been true from buying that great brass model or the plastic one, the craftsman kits or the Cornerstones. I call it a tool and IMO a very good one. Thank you for sharing. I agree. Like the construction industry in the US, attitudes in model railroading change slowly. Some people will see this as the “game changer” that many claim it to be while for others it will merely be the latest got-to-have-it thing in a box. That said, I truly enjoyed my experience with it and wish the guys much success. Thanks for the kind words Tom. I agree that in the end, it all comes down to an individual’s choice. Glad you’re enjoying your hobby on a deeper level. Mike, it’s great to get feedback from someone pursuing a very peculiar approach in modelism. I’m not into miracle products and gimmicks, but this type of control can definitely bring life to layout designs once considered too simple or not challenging. Reading your first experiments with the throttle, I tried to imagine how operating a simplistic layout such as Harlem Station would become a real challenge (if not hell) given the extremely short leads. A small mistake you end up in the Harlem River in a matter of time. Once again, thanks for sharing your first impression. It’s great to see how Scott’s exacting demands and vision, with dedicated partners, are helping to shape a fundamental aspect of this hobby. You’re welcome and thanks Matt.